Here at Master Dog Training, we pride ourselves on the creation and development of our unique High Intellectual Education Program that will makes the skills, behavior and obedience of your dog truly remarkable. Our very knowledgeable trainers, with over twenty years of experience, use the most advanced, proven techniques from Russia, Germany, Israel and Turkey to sharpen the intelligence of the dogs in this program in a variety of ways to get results that will make your four legged friend an even more valuable member of the family – and a real joy to be around at all times. This advanced mental training takes perseverance and is not easy not accomplish. But while it’s not normally in the dog’s nature to easily obey such sophisticated commands, the extra time and effort required here will pay big dividends both inside and outside the home. There are four categories in this special training – Physical Education, Geometrics, Mathematics and Communication – that all play a big role in helping to improve the brain power and performance of your dog. 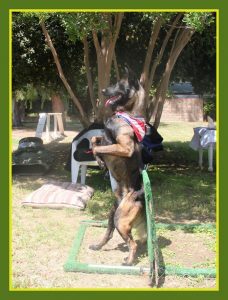 Physical Education Training teaches the dog to move different ways in different situations. Heeling, Walking Forward, Backward and Sliding Side to Side (left to right and right to left) are all important instructional commands to increase the dog’s capabilities and usefulness. The “BUNNY COMMAND” greatly helps a dog with its vertical balance – and this turns out to be a wonderful new skill, for example, for a Service Dog helping its handicapped owner reach up to a door knob and open the front door to the home. At the same time, walking on its hind legs builds up its leg muscles in a very healthy manner. 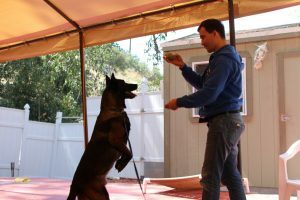 With Geometrics, the task given to the trained dog by its owner has multiple purposes that include moving in certain directions, taking or picking up certain objects and PLACING them in certain positions. Geometrics makes the trained dog able to identify certain objects and figure out whether they’re high or low and near or far away. It’s also trained to recognize if it’s more than one object that needs to be moved – and besides being taught to skillfully judge distances, the dog is also trained to remain with the object or objects in the PLACE position for as long as necessary..
There’s also an important tie-in between Geometrics and Communication, with the owner using the repetition of simple sentences and verbal commands to slowly but surely make the dog better understand its task. These communication skills help a lot in getting your dog to recognize and identify the objects. For example – when you want to feed your canine, and you ask it to bring over its bowl, it happily obeys. And when you ask it to sit in its favorite chair with a favorite toy, your dog, eager to please, will also be able to quickly comply. Amazingly, our Master Dog Trainers are also able to teach your dog to do Mathematics. After the proper training, you can hold up two fingers on each hand – and ask it to count two plus two – and without hesitation, your dog will bark four times! If you put five of its toys on the ground nearby, it will then bark five times as well. And again, this proves to be very helpful for a Service Dog now able to alert its handicapped (and perhaps blind) owner that there are four chairs in his path on the way to the exit of an office building. And there’s one other skill contained in the High Intellectual Training Program that’s also quite amazing. If your family happens to be religious, and you like to pray when first sitting down to dinner, we can also teach your dog to also bow its head and thank the Lord for Good Food, a Good Family and Home – and even for good trainers. And after you enroll your beloved dog in our High Intellectual Education Program, you’ll thank our trainers as well – as their devotion, professionalism and sense of caring will make your Family Dog an even better companion than you could ever have possibly imagined.